Medieval Armenian Philosophy Sen Arevshatyan. Director of the Matenadaran Vahan Ter-Ghevondyan delivered an opening speech. Acting Mayor of Yerevan Kamo Areyan, Sen Arevshatyan's daughter, Doctor of Arts, Professor Anna Arevshatyan, Director of the Institute of Philosophy, Sociology and Law NAS RA, Academician Gevorg Poghosyan, Doctor of Arts, Professor Hravard Hakobyan, Doctor of Philosophical Sciences, Professor Hrachik Mirzoyan, Doctor of Philosophical Sciences, Professor Karlen Mirumyan delivered speeches. The word of blessing was sent by T. Archimandrite Zakaria Baghumyan. The event was attended by relatives of Sen Arevshatyan, employees of Matenadaran, honored scholars, spiritual fathers and cultural figures. Matenadaran's administration submitted the proposal for the placement of the commemorative plaque dedicated to Sen Arevshatyan. 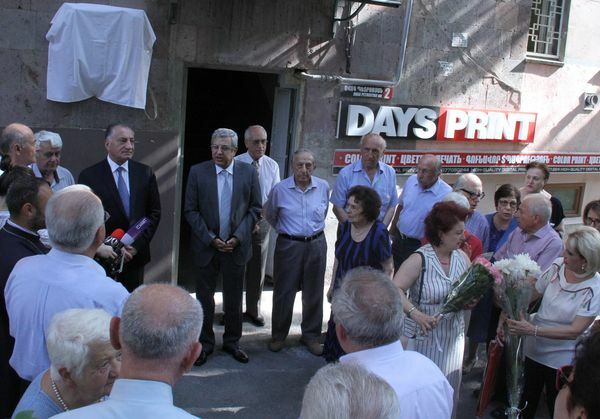 The author of the commemorative plaque is Doctor of Architecture, Professor Ashot Grigoryan.